Adults who work full time in the United States log an average of 47 hours a week, according to our friends at Gallup. I know many who work far longer than that in seven days time, which brings me to the point of today’s post: the design of your work space matters. First, I’m a big fan of her work – mixed media pieces that evoke another era, one steeped in the beauty and wonder of the natural world. Second, I couldn’t wait to tap into the creative energy that fills the Hot Shops, a downtown landmark that’s home to four anchor studios, more than 80 studio artists and multiple spaces. For starters, Jennifer knew she wanted to add color to at least one of her studio’s two existing white walls. I talked her into a deep gray – Sherwin Williams Iron Ore.
She was a little shocked at first, but I assured her it wouldn’t feel oppressive in the space, which long ago had served as offices for the Serta Mattress Factory. I’m a big fan of this hue – I’ve got it in my home office and LOVE IT! I love, love, love Sherwin Williams Iron Ore that helps showcase Jennifer’s work. “She was right,” Jennifer said of the bold color choice. “The deep grey added an edginess and showcased my artwork beautifully.” We also agreed to leave an expansive plywood wall in the studio unpainted. Jennifer’s studio is a working space in a former factory, so it shouldn’t be too “pretty.” It needs to function as a gallery and retail space for her work plus shirts, cards, prints and other items. 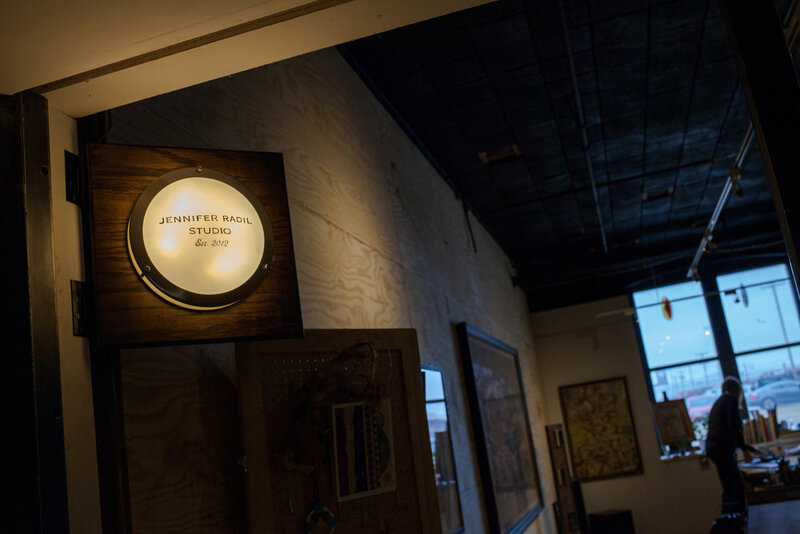 Since the studio is at street level, Jennifer had concerns about maintaining privacy at night, which I totally get – how unnerving would it be to find someone peering in at you from the sidewalk? We removed the plywood from a large window and discussed a variety of treatments that might work. In the end, we went with the simple and most effective solution: placing a row of tall atlases on the deep windowsill along with a framed piece of vintage wall covering on an easel. Perfect. A carefully curated selection of books, plants and framed art on an easel provide a natural buffer between Jennifer and those passing by on the sidewalk. This corner of Jennifer’s studio is the perfect place for a retail display. The final thing we did was rearrange the furniture and displays in a way that maximized both appearance and functionality. We created a display along a wall outside the studio that naturally draws people in. The kicker? We only used tools and art objects plucked from Jennifer’s belongings. Awww, thanks, Jennifer! Want us to do the same for you? Schedule a meeting today!